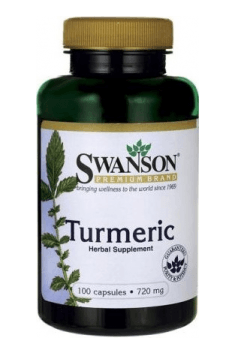 Swanson Turmeric is a dietary supplement with 720mg of high-quality turmeric (Curcuma longa L.), and to be more exact - a turmeric extract which consists of a powerful amount of biologically active substances - curcuminoids. The economical formula allows every person to enjoy the best in turmeric , amazingly improving the health of the whole organism. Turmeric (Curcuma longa L.) - used as a spice; a perennial species from India; it contains many biologically active substances called curcuminoids, including curcumin (yellow colourant), desmethoxycurcumin and bisdemethoxycurcumin. Turmeric has anti-inflammatory, antioxidant (fights free radicals), antiviral, antimicrobial and antifungal characteristics. Effect on brain functions: Turmeric effectively protects nerve cells from damage (it is neuroprotective). It increases the mood, has an antidepressant effect, probably by inhibiting the enzyme of monoamine oxidase, whose effect is much higher in people who suffer from depression. It contains an important compound for the health of the brain – turmeron, which affects the proliferation and differentiation of stem cells in the brain area, through which it can accelerate the regenerative processes in the most important organ in the organism. Another active compound in turmeric - BDMC - stimulates the immune system to destroy the proteins which, in big residue deposits, impede neurotransmission in some brain areas, causing memory and personality disorders. Those deposits are also responsible for the dying of neurons. Scientists give us hope that the discovered substance will be used in treatment of people who suffer from Alzheimer's disease. Neoplasms: Curcumin, that is the turmeric yellow colourant, is an extraordinary component demonstrating a high anti-inflammatory and antioxidant potential. Research suggests that it may be helpful in preventing and treating many types of neoplasms: skin, lung, oesophageal, oral, head and neck, stomach, pancreatic, small intestine, liver, colorectal, bladder, prostate, cervical and breast cancer and lymphoma. Wide-ranged academic studies have shown that curcumin significantly slows down or completely inhibits the development of tumour cells. What is more, it increases the effectiveness of radiotherapy and chemotherapy, as well as enables reducing the dosage in those therapies. It works particularly well with other antioxidants, such as quercetin. Gastrointestinal tract: Turmeric stimulates bile secretion, facilitates its flow through the bile duct, stimulates gastrin, secretin and pancreatic enzymes secretion, has a relaxant, antimicrobial and, to some extent, anti-inflammatory effect. It can be successfully used against Helicobacter Pylori, responsible for gastric ulcers. It prevents flatulence, congestions, a sensation of fullness, digestive disorders, cholecystitis, ascending cholangitis and gallstone formation. Immune system: Turmeric can be helpful in preventing fungal, viral and bacterial infections, including tuberculosis, through increasing cathelicidin level - a peptide with bactericidal characteristics that are effective against a wide range of microorganisms. It also proves to be effective in fighting viral infections by inhibiting the viral life cycle. Liver: In conducted experiments, researchers found that turmeric protects the liver - it can protect its cells from toxins, or even help with cell regeneration in the organ. Joints: As one of bioactive components of turmeric, curcumin inhibits degeneration in joints through its visible anti-inflammatory characteristics, which is particularly relevant for people who suffer from rheumatism, that is the degeneration of the musculoskeletal system, as well as those who have sports injuries. Swanson Turmeric is a dietary product which is beneficial for health in many aspects. It is recommended for everyone as preventive healthcare and treatment of any disorders in the functioning of the system. It supports the functioning of the liver, the gallbladder, the brain, the nervous system, joints and the gastrointestinal tract. It prevents neoplasms, has an antioxidant and anti-inflammatory effect, increases the sensitivity to insulin and leptin and facilitates the reduction of unnecessary fat tissue. Capsule (gelatin), Anti-caking agent (Magnesium salts of fatty acids).